Applications will be available and accepted for 2015 Maritime Heritage Grants between May 15 and August 3, 2015. A total of $1.7 million will be available. Applicants may request $50,000-$200,000 for preservation projects, or $15,000-$50,000 for education projects. For more information visit the NPS 2015 Grant Program and Application Information. 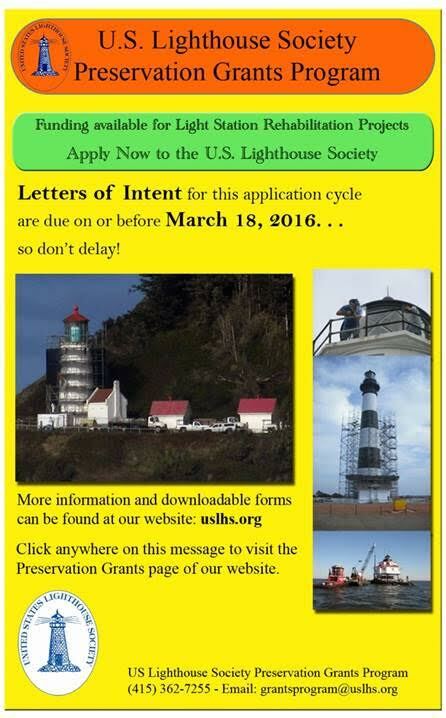 Funding has always been an important concern for lighthouse preservation. ALC has started a resource page for funding sources. What others programs should Ted consider and/or be added to our list?